Europe-bound holiday travelers will not want to miss a stroll through a Christmas market (or two) during the holiday season. These festive institutions can be found in almost every capital, and exploring the wonderlands of treats, souvenirs and stocking-stuffers is a wintertime tradition. Read on for our favorite Christmas markets, from Paris to Salzburg. 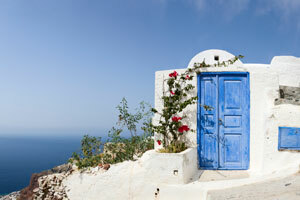 Contact Indagare for assistance planning an escape this winter. 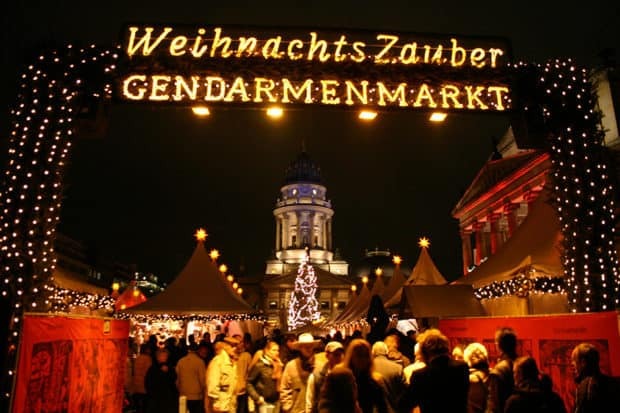 Gendarmenmarkt Christmas Market (November 26 – December 31), held in the fabulous Mitte neighborhood, beautifully melds old and new craftsmanship in its month-long celebration of the holidays. Some of the most authentic Christmas shopping in the city can be found here, with dresses, woodcarvings and photographs on offer. We suggest watching the craftsmen at work and catching a performance on the main stage, which occur throughout the day. Winter World at Potsdamer Platz (November 2 – January 6) is ideally located as a stop in between touring Berlin’s highlights. In addition to shopping, activities include tobogganing down a manmade hill of snow and ice skating. Winter Wonders (November 30 – January 6) is the largest and most pedestrian-friendly of all the Christmas markets. Cordoned off to vehicles, the area feels tucked away from the city bustle and transports visitors to a brightly lit wonderland of sparkling neon Christmas lights, ferris wheels, merry-go-rounds and even a slalom. Winter Wonders spans multiple locations, so it is recommended to go with a guide who can direct you to the best vendors. 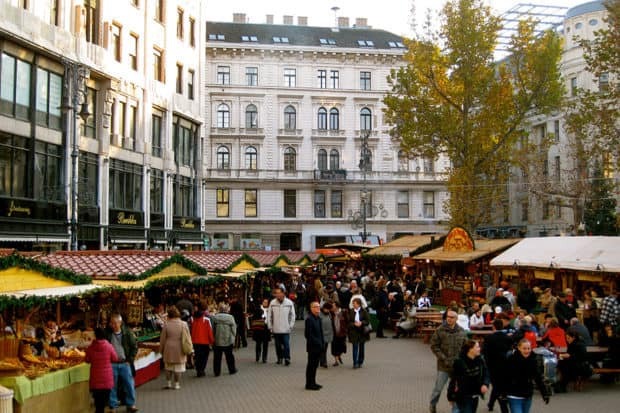 Vorosmarty Square Christmas Fair and Festival (November 9 – January 1) is a top-notch local street food market. It’s known for its trdelniks, a type of grilled cake, and langos a deep-fried, savory dough that can be served with butter, garlic, cheese or bacon. 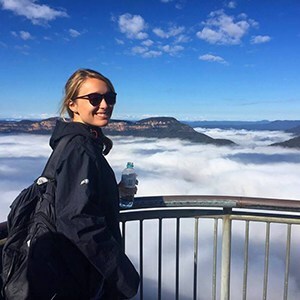 There are plenty of activities on offer, though the inaugural welcoming of Santa on December 6 is a festive highlight. Visitors can go for a skate, shop for hand-blown glass ornaments and hand-carved jewelry boxes, and watch performances from local folk musicians. Basilica of Budapest Christmas Market (November 23 – January 1), with its plentiful stalls and skating rink, is best visited in the evenings, when a light show is projected onto the Basilica. 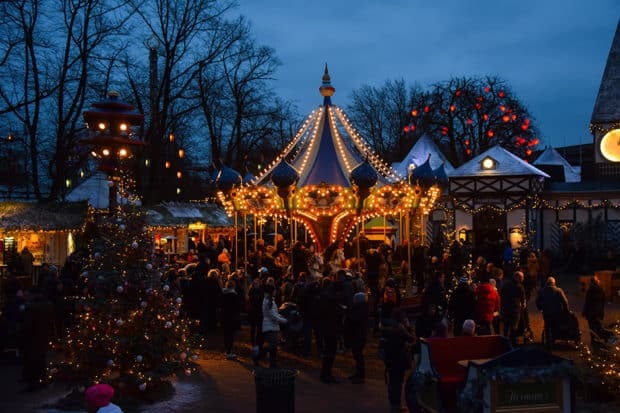 Tivoli Gardens Market (November 17 – December 31) is Copenhagen’s most enchanting and family-friendly market. Complete with festive music, decorations and 60 food stalls filled with donuts and mulled wine, the garden hosts amusement park rides and a series of fantastical light and fireworks shows during the season. The cozy Freetown Christiania Christmas Market (December 8 – 20) is held indoors at Christiania’s Grey Hall and is ideal for travelers looking to venture off the beaten path. It has the feel of a flea market, with traditional Scandinavian delicacies, funky home goods and trinkets on offer. Hyde Park’s Winter Wonderland (November 17 – January 1) is London’s answer to all things Christmas, with live performances, a giant skating rink, roller coaster rides and festive street food. The massive festival attracts travelers from across the world, and offers something for everyone, from a comedy club to a cinema to circus and ice shows. 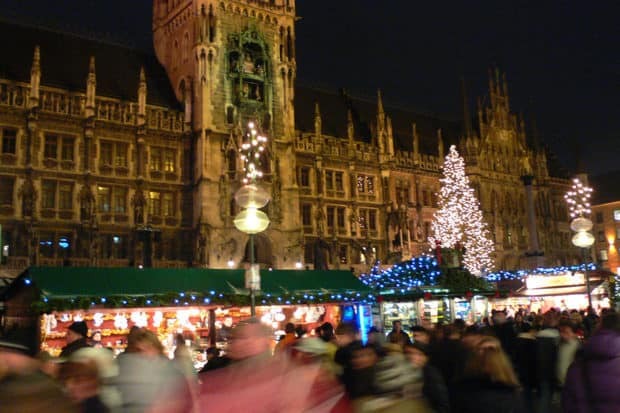 While Sweden is known for its glogg, Munich is renowned for its gluwein— a type of mulled wine that is nowhere better consumed than at Marienplatz Market (November 27 – December 28). Pair a glass with a freshly baked pretzel and enjoy the festive backdrop of nativity scenes and advent music. Don’t miss a look at Neues Rathaus, Munich’s city hall, which is festively lit up during the holidays. Marché de Noël Paris Notre-Dame (December 15 – 24) is held on René Viviani Square for fewer than 15 days each year. Hosting 40 local craftsmen, the market offers charming French objets d’art and Boules de Meisenthal (Christmas ornaments) along the Seine. Be warned, per usual, this area is extremely crowded. At the Left Bank’s charming St-Germain des Prés Christmas Market (December 1 – January 1), vendors are focused on evergreen, locally sourced products (such as accessories) and high-quality provisions rather than sweets and holiday tchotchkes. 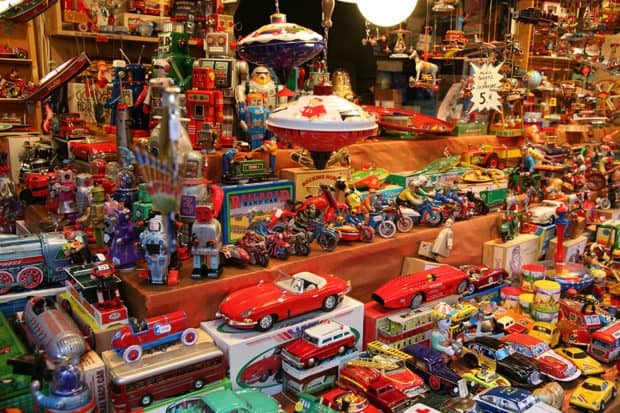 The market is small, and perhaps a bit less festive than the others, but worthwhile. Another favorite local holiday activity is ogling Avenue Montaigne’s haute couture Christmas trees, decorated and auctioned off annually by designers. While only a year old, the Village de Noël du Champs de Mars (December and January) offers a smorgasbord of international foods and crafts, but the highlight is the skating rink at the foot of the Eiffel Tower. 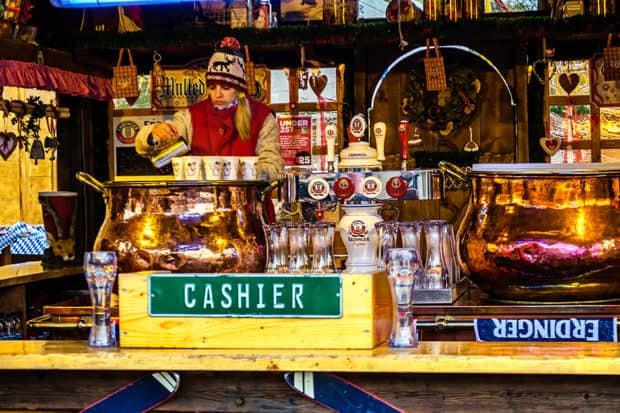 Wenceslas Square Market (December 1 – January 6), named after the fabled Good King, is made up of small, wooden huts serving Pilsners, mulled wine, spit-roasted hams and trdelniks, delicious fried pastries. Baked over a flaming hot grill, these rolls of dough are covered in cinnamon sugar and filled with Nutella—and are reason alone to visit the market. 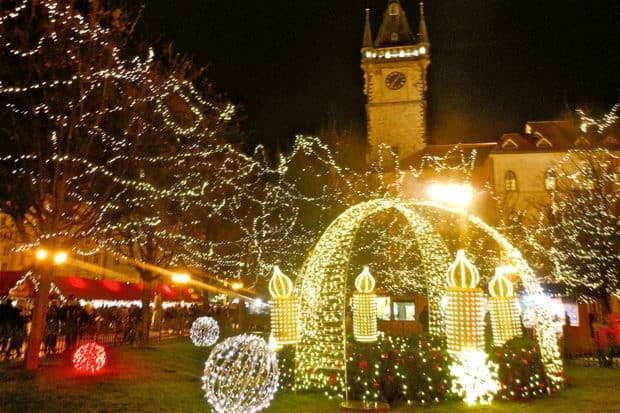 Just five minutes from Wenceslas Square, Old Town Square Market (December 1 – January 6) has an extremely impressive Christmas tree that is illuminated daily at 4:30 p.m. Children will also appreciate the host of animal stables depicting the Nativity Scene, which also functions as a petting zoo. In a nod to Vatican City, Piazza Navona Christmas Market (December 8 – January 6) is centered around a nativity scene beside St. Peter’s Basilica, and has gorgeous, hand-carved nativity figurines for sale. On January 5, look out for live performances of La Befana, a legendary Christmas witch who delivers gifts to children. Southern Italy’s pizza capital embraces the country’s religious heritage with a year-round Christmas market in front of the stately 12th-century San Pietro Cathedral. Marzipan, candy and other local Christmas treats are served with an elaborate nativity scene as a backdrop. Be sure to pick up an intricate figurine as a souvenir; these hand-crafted pieces are the market’s main attraction for many. Located in the world’s capital of The Sound of Music and Mozart, Cathedral Square Market (November 21 – December 26) offers a superb collection of artisanal goods and handicrafts, especially ornaments. Favorites include engraved horseshoes, hand-painted cowbells and needlepoint pillows sewn with traditional German phrases. Schloss Hellbrunn Market (November 22 – December 24) adds to the beauty of the Schloss Hellbrunn palace with its decorated fountains, grottos and the iconic gazebo from The Sound of Music. Petting zoos, pony rides and a Christmas-themed post office pop-up are pluses for families. There’s even a portion of the castle devoted entirely to the eerie myth of Krampus. 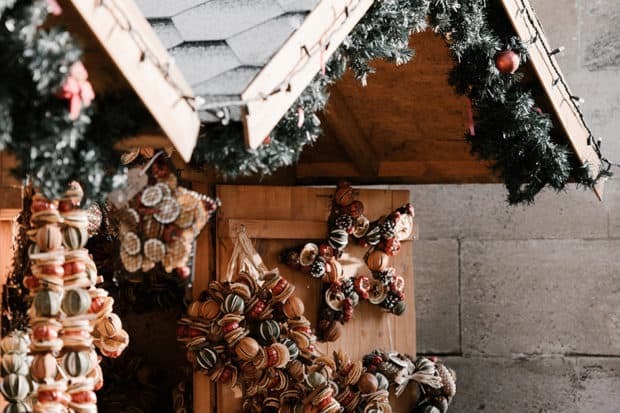 Skansen Christmas Market is centered around a charming outdoor museum that pays homage to traditional agricultural practices and ways of life (weekends, November 24 – December 16). Go for the holiday cheer and the delightful scent of traditional sausages, cheeses and sweet spices that fill the air. 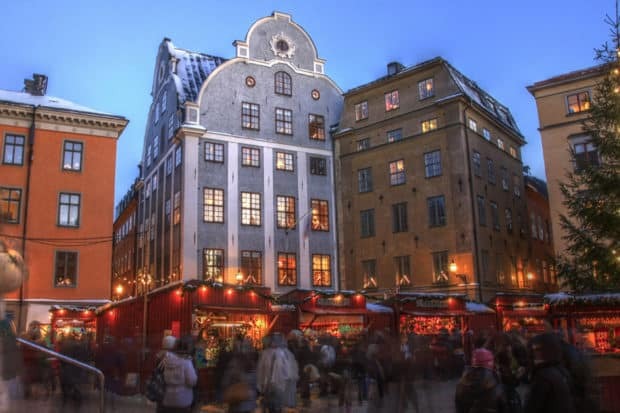 Stortorgets Market (November19 – December 23) has been held in Stockholm’s oft-photographed Gamla Stan (Old Town), since 1837, and is one of the world’s most popular and recognizable venues for holiday shopping. Indulge in such Swedish Christmas dishes as halmbockar (goat) or råraka (hash browns), served with lingonberry jam and fried pork. Or, purchase a traditional advent candle holder; the handicrafts here are unique and wholly indigenous to the region. One of oldest in Europe, Christkindelsmärik (November 23 – December 30), made up of 11 smaller markets, is a charming ode to the traditions of French Christmas. We recommend attending a classical concert and going for a horse-drawn carriage ride around town before admiring the 100-foot Christmas tree. Held outside the former imperial summer palace, Schonbrunn Palace Market (November 18 – December 26) is well-paired with a late afternoon tour of Gloriette and the Schonbrunn Apartments. 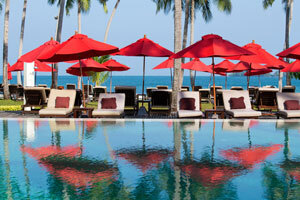 As the sun sets, enjoy a tapas-style dinner of traditional delicacies from several of the food stalls. City Hall’s Rathausplatz Market (November 17 – December 26) is easily accessible from the city center, and offers an ice skating trail full of twists and turns. We suggest visiting in the evening, when the rink is at its most atmospheric. Located in a historic district of the city, Spittelberg Market (November 16 – December 23) is intimate, with stalls lining narrow alleyways and side streets. Vendors sell some of the most handsome artisanal handicrafts in the city. 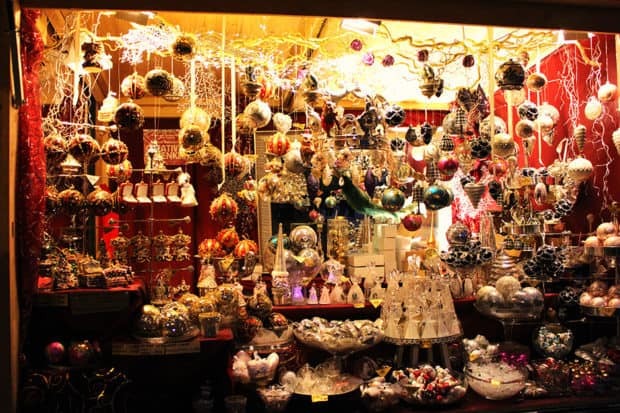 Located in the heart of Old Town beside the Barbakan Fortress, Barbakan Christmas Market (November 24 – January 6) is popular with both locals and visitors for its hot beer, fresh pierogis and the best holiday shopping in the city. Highlights include handmade amber jewelry, hand-knit sweaters, leather slippers and traditional Polish ornaments. For those craving sweets, opt for a loaf of piernik gingerbread. 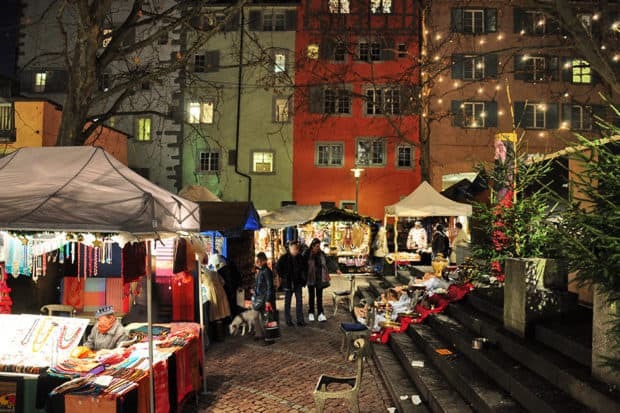 Wienachtsdorf (November 22 – December 23) is one of Zurich’s largest Christmas markets and is located directly in front of the Opera House. Selling Swiss fondue and other traditional dishes, locally sourced jewelry and ornaments, Wienachtsdorf’s main attraction is its gorgeous ice rink. Here, visitors are invited to enjoy a casual skate or try their hand at curling. Weihnachtsmarkt and the Singing Christmas Tree (November 23 – December 23) is both bizarre and enchanting. Standing on multi-tiered, elevated platforms, carolers from varying Swiss regions sing nightly beside a large Christmas tree structure. At Christkindlimarkt (November 22 – December 24), Zurich’s main train station, a 50-foot-tall Christmas tree rivals Rockefeller Center’s. With one of the largest indoor markets in Zurich, Christkindlimarkt is a good shopping stop prior to a train ride to the Alps.